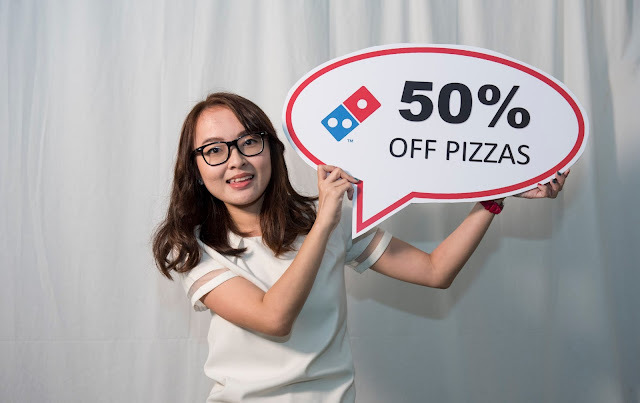 I'm pleased to share that Domino's has recently come up with a 2016 promotion : 50% OFF large and extra large pizzas for all online deliveries in Singapore! Ordering pizzas are a fuss-free way to enjoy oneself in corporate gatherings, birthday parties, school gatherings and more. With pizzas, it's difficult for any party or event to go wrong... because your guests are most likely to love at least one flavour and one type of crust! 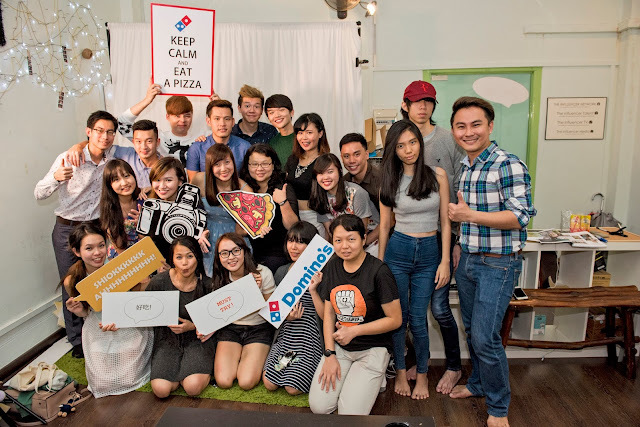 THANK YOU William for inviting us to a Dominos' party at your cozy office. In this modern age, nobody goes 'YUM SENG (cheers in mandarin)' anymore with their drinks. It's all about snapping way photographs of food! Cameras and phones say 'cheers'! Pizzas are a great way to keep you company if you're an introvert like myself, hahaha. For a period of time, I sat at a corner of the room enjoying my pizza! 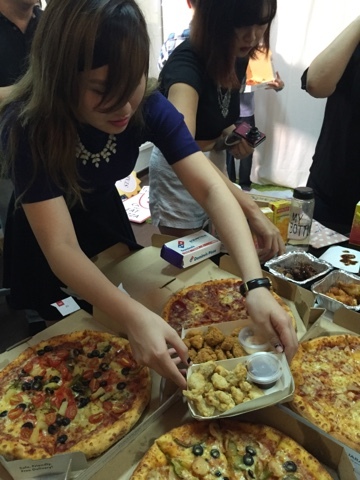 Here's a confession though — while the others were talking, I unknowingly took 4 pieces of pizza to eat. 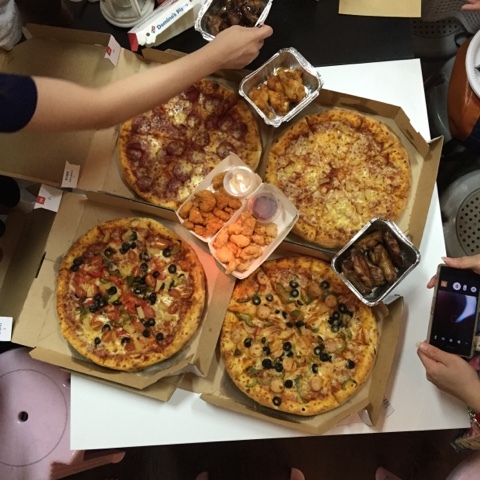 They had to order a second round of pizzas delivery (and I still felt hungry, LOL). 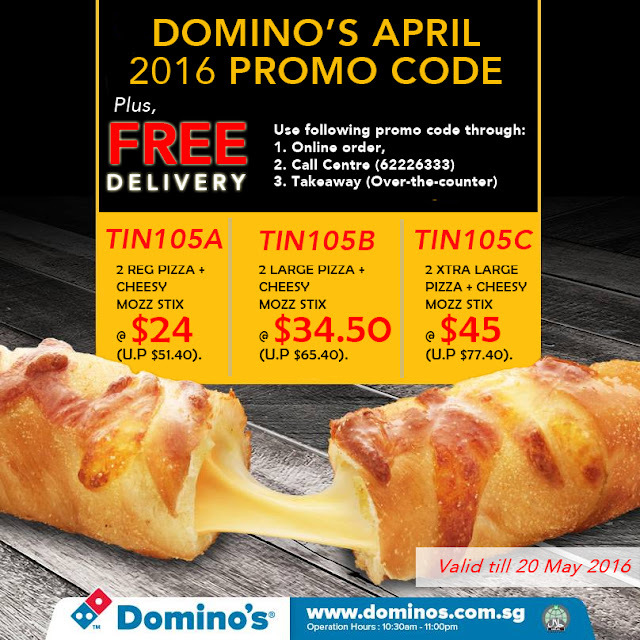 I'm sorry, because Dominos Pizza just taste so good. 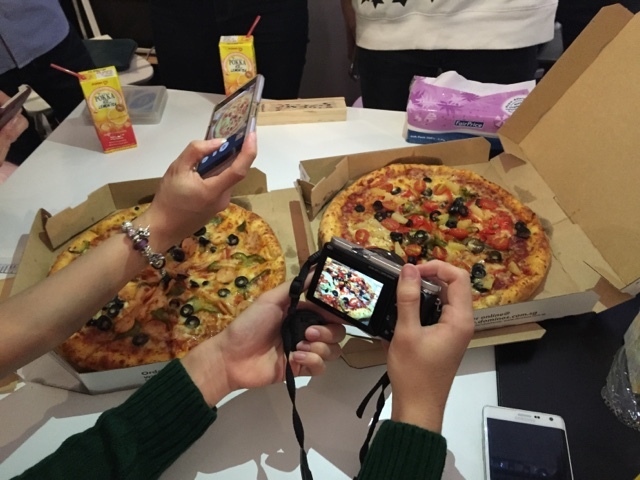 Caught in the act of taking pictures of pizza! 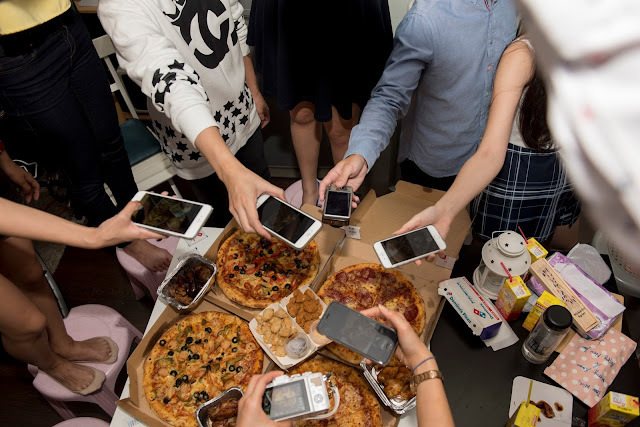 Look at the number of phones— the pizzas are indeed a celebrity! I LOVE YOU DOMINOS PIZZA!!! 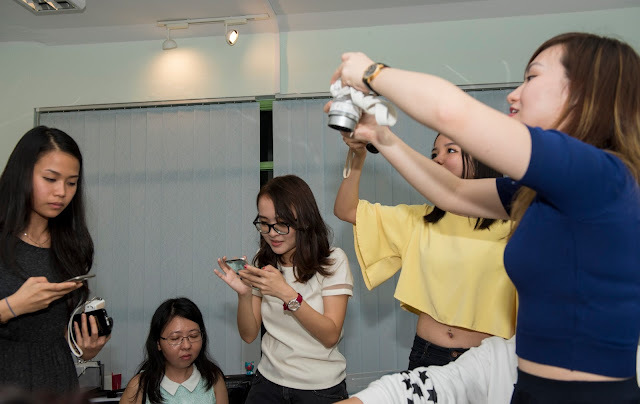 It was great fun meeting many new bloggers and friends, such as Carine, Shaun, Zonghan and Tanglin actress, Shayne. As pizzas are famous for its round shape, the 45 degrees angle works best to show off the ingredients that are placed on it! 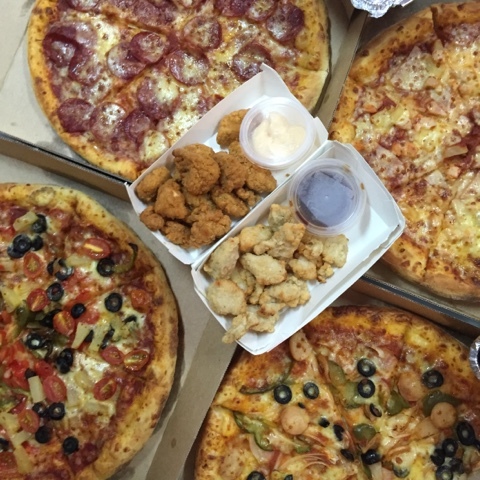 The top-down shot is great if you have at least four pizzas on the table! 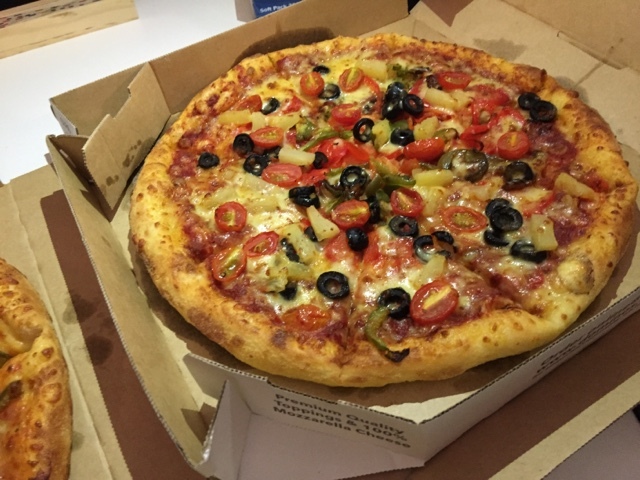 As you can see, we ordered several types of large pizzas and appetisers from Domino's Pizza. I really liked the Banana Kaya Pizza, an innovative pizza exclusive to Singapore! 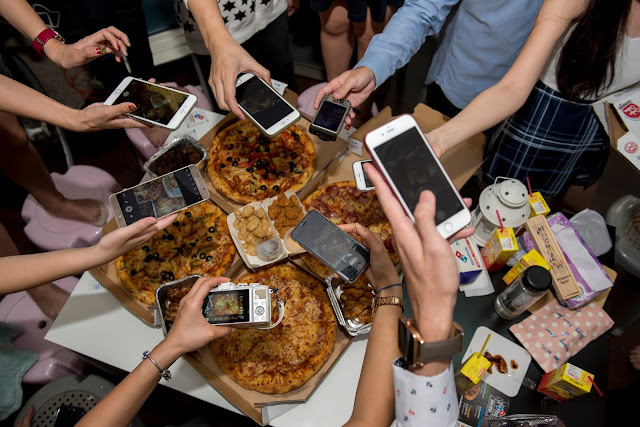 Arranging the food for the photo! Click the 'share' button below to share with your friends and family now!